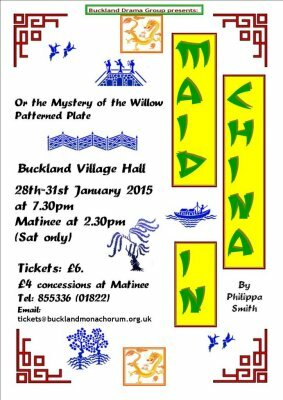 The plot of ‘Maid in China’ is based on the legend of the famous blue & white ‘Willow Pattern’ found on pottery. It concerns a Chinese Mandarin who has a beautiful daughter named Koong Shi (Princess Jasmine in our play) whom he promises in marriage to the wealthy Grand Duke Tajin. But she is in love with her father’s secretary, a handsome man named Chang and refuses to marry the Grand Duke. Her father is furious and locks her in her room while he makes the arrangements for the wedding. However, on the eve of the wedding, Chang returns and the couple escape into hiding. Long ago, a Chinese mandarin had a beautiful daughter named Koong Shi whom he promised in marriage to a wealthy old merchant. But Koong Shi was in love with her father’s secretary, a handsome man named Chang. Her father was furious and locked her in her room overlooking the river while he hastened with the wedding preparations. Chang wrote her a note declaring his undying love and floated it down the river in a coconut shell. She sent back a note urging him to take her away. Chang waited until the eve of the wedding and in the confusion, carried her away together with her jewel box. The father gave chase and hence the traditional three figures on the bridge, Koong Shi carrying her staff, Chang with the jewel box and the father with a whip. They took refuge in the house by the river but in savage temper the father burnt it down. But, just in time, kindly gods transformed the lovers into a pair of turtle doves so they could fly around the river for ever. That’s the legend. The truth behind the legend? In the eighteenth- century England there was a young man named Thomas Turner. Against his doctor father’s wishes he apprenticed himself as a potter to a famous factory in Worcester. When he had served his time he set out as a journeyman potter and landed in Shropshire with an old potter named Gallimore. He married Gallimore’s daughter and the took over the pottery. He introduced fine porcelain to the business and following a visit to Paris he returned with some Chinese motifs which he introduced onto his pottery. Thus an early version of the willow pattern was created. One of his designers was Thomas Minton, who, when he left to start his own successful business, developed the patterns from the original copper plates. He sold the designs to a variety of factories who each adapted the motifs, including the bridge, the figures, the pagoda, the trees and the apples to their own taste. So, there is no standard pattern. The willow pattern is an English creation! And that’s the true story.